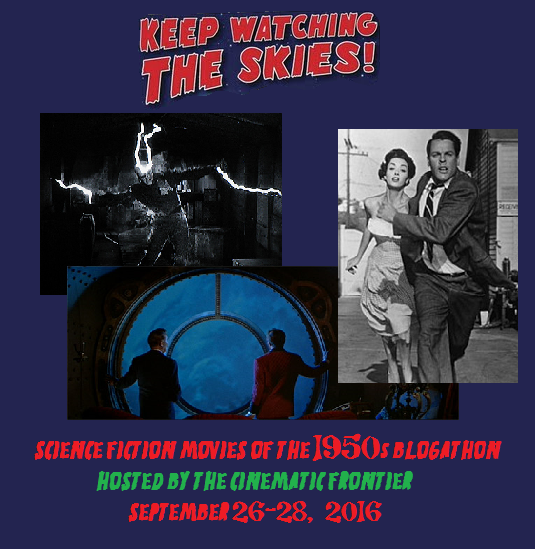 Announcing the Keep Watching the Skies! 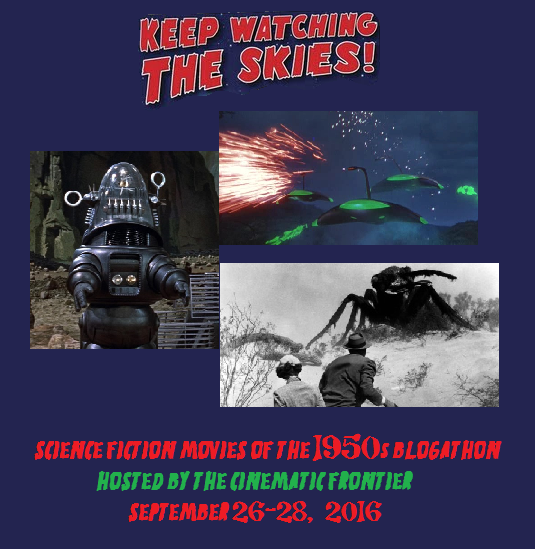 Science Fiction Movies of the 1950s Blogathon! Image from Robert Wise’s 1951 classic “The Day the Earth Stood Still”. My favorite era of science fiction films is the 1950s. It’s described as the classic era where many of the sci-fi productions were low-budget films designed for a largely teenage audience. While many were formulaic, gimmicky, comic-book style films, they drew upon the political themes or public concerns of the day, including depersonalization, invasion, and fear of nuclear weapons (Earth and/or humanity were a constant target; the threat of the real-life Cold War loomed over these films). 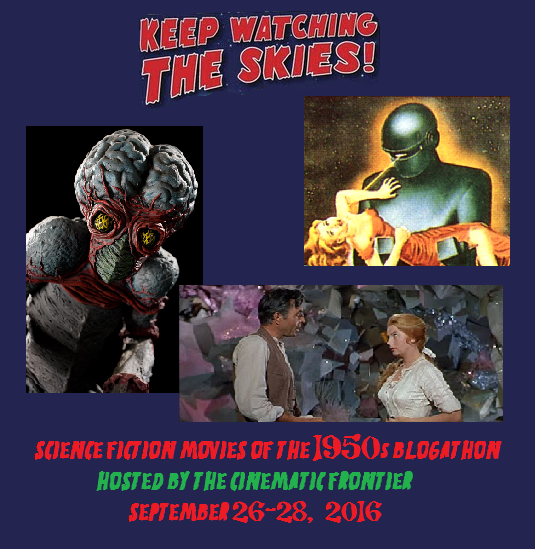 For the purposes of this blogathon, you can contribute a review of a 1950s sci-fi feature film. You may also suggest a blogathon-related topic to write about (pending my approval). These must also be brand new posts (no recycling of old posts). No duplicates (there are so many science fiction films from the 1950s to choose from, except Forbidden Planet, which I will be covering). If you’re having difficulty in choosing a film, please check here. To submit your choice, please include your name, the name of your blog, your blog URL, and your choice in the comments section below. I will update this post as often as possible with the latest roster additions. Once your submission is confirmed, please choose one of the banners below and use it on your blog to promote this event. Don’t forget to spread the word to your fellow bloggers as well as on Twitter, Facebook, etc. (use the hashtags #KeepWatchingtheSkies! #ScienceFictionMoviesofthe1950sBlogathon; it would be most appreciated). The blogathon will take place from Monday Sept. 26th through Wednesday Sept. 28th. You can post your entry on your blog on any of those days (or slightly ahead of time if you wish). Just let me know by posting a link below in the comments section and I will post a blogathon update for each day (and for those of you on Twitter, I will retweet your blogathon post tweets). I hope I’ve covered everything, but if you have any questions, feel free to ask me. Otherwise, have fun and I look forward to reading your posts! This entry was posted in Film Tributes and tagged "Destroy All Fanboys! ", 1984, 20000 Leagues Under the Sea, Attack of the 50 Foot Woman, CineMaven's Essays From the Couch, Cold War, Creature From the Black Lagoon, Desk Set, Film Music Central, Forbidden Planet, In the Good Old Days of Classic Hollywood, Invaders From Mars, Invasion of the Body Snatchers, Keep Watching the Skies! Science Fiction Movies of the 1950s Blogathon, Moon In Gemini, Musings of a Classic Film Addict, Old Hollywood Films, Radiator Heaven, Robert Wise, Some Polish American Guy Reviews Things, The Abominable Snowman, The Cinematic Frontier, The Day the Earth Stood Still, The Hitless Wonder Movie Blog, The Midnite Drive-In, The Oak Drive-In, The Phantom From 10000 Leagues, The Quatermass Xperiment, The Thing From Another World, The War of the Worlds, The Wonderful World of Cinema, The World the Flesh and the Devil, Them, Wolffian Classic Movies Digest. Bookmark the permalink. My deep deep apologies for missing the deadline with my submission of “Attack of the Fifty Foot Woman.” Life just got away from me. I’m so sorry. Here mine. Some Creepy B&W Hammer Sci-Fi/Horror from 1955 – THE QUATERMASS XPERIMENT. Thanks a bunch for hosting this ! Pingback: (Not So) Random Film of the Week: GOG | "DESTROY ALL FANBOYS!" Hi Louis. Would it be alright if I change my entry? I’m not that much familiar with science fiction films, but if it’s alright, I would like to write about “Desk Set” ( 1957 ) instead. It’s not classified as a science fiction, but it certainly does have many elements of it. As long as your post emphasizes those elements, I’m willing to allow the switch. Thanks Louis. I will focus on those elements. Sure. Sorry for the late response. Welcome aboard! The War of the Worlds(1953) and Invaders from Mars in a double feature review called the martian classics of the 1950. Go right ahead. Welcome aboard! Great idea for a blogathon. I’d like to review THEM! Your listing is updated. Thanks! I would like to review The Thing From Another World for Old Hollywood Films if that one’s not taken yet. Hello. I’d like to do The Creeping Unknown (1955) if possible. Thanks ! Sure. I’ll list it under its original title: The Quatermass Xperiment. Welcome aboard! Hi, this is Dan from The Hitless Wonder Movie Blog (dandayjr35.blogspot.com). I’d like to participate in this blogathon by writing a post on the 1957 Hammer film “The Abominable Snowman of the Himalayas”. Have at it. Welcome aboard! Hey science fiction films from the 50s are my favourite! I’d like to write about 1984 (the 1956 version of course)! Hi, I’d love to join in! Please put me down for The World, the Flesh and the Devil (1959). Love me some post-apocalyptic angst. I was a history major in college. I always had a pipe dream of writing a book on the Red Scare and how it was approached through the sci-fi genre. Never actually got around to it. Maybe I could do something a little more compact as a blog entry. An overview is my plan, but as an alternative, in case that is unacceptable, I’d choose Invasion of the Body Snatchers. Invasion of the Body Snatchers is yours. Welcome aboard! What a wonderful blogathon idea! I’ll take Creature from the Black Lagoon (1954) if that’s available. I’d be talking about it here on Musings from a Classic Film Addict https://annsblyth.wordpress.com/ . Thank you! Thanks! It’s yours. Welcome aboard! 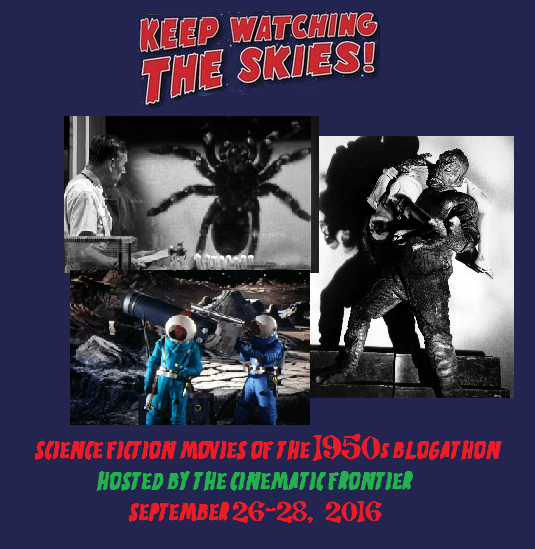 Check out Louis from The Cinematic Frontier’s upcoming blogathon – Keep Watching the Skies! Science Fiction Films of the 1950’s! i’m in! can I do Destination Moon (1950) and From the Earth to the Moon (1958)? It is and it’s yours. Welcome aboard! 🙂 I’ve reviewed many of the 50’s sci-fi and horror flicks, but haven’t done this one yet. It will be fun! Hi Louis. I’ve decided on my first film. I’ll take “20,000 Leagues Under The Sea” if that’s ok? Pingback: Random Film of the Week: This Island Earth | "DESTROY ALL FANBOYS!" Excellent. Greg from Destroy All Fanboys (fanboydestroy.com) here – I’ll grab This Island Earth, as it’s one of those classics that’s been horribly maligned thanks to MST3K turning it into a comic shell of its former near greatness and some younger viewers getting the wrong impression since. Have at it! Welcome aboard! Also check out the special features on the Mystery Science Theater 3000: The Movie blu-ray; one of them explores how This Island Earth ended up being chosen for the film, the odd circumstances that resulted in MST3K: The Movie having a running time that was unusually shorter than a regular episode from the TV show, and how that affected which portions of This Island Earth were shown in the film. That clipped run time always bugged me on MST3K:TM, but I’d read an interview done around or after the release that covered some of the stuff you mentioned. I don’t hate that film, mind you. I just got into defending TIE’s honor for a bit when it popped up in conversations as a “worst sci-fi film” candidate solely based on the parody’s take on it. I read your updated article. I enjoyed it, but since it’s an updated post, I’m going to need a new pick from you for the blogathon. Just let me know which one you decide to go with. Thanks! Very nice. Welcome aboard (again)! Swell. I’ll make up for my absence in your Mel Brooks blogathon, and I’ll do two entries for this blogathon. Cool! Let me know when you’ve made your choices.